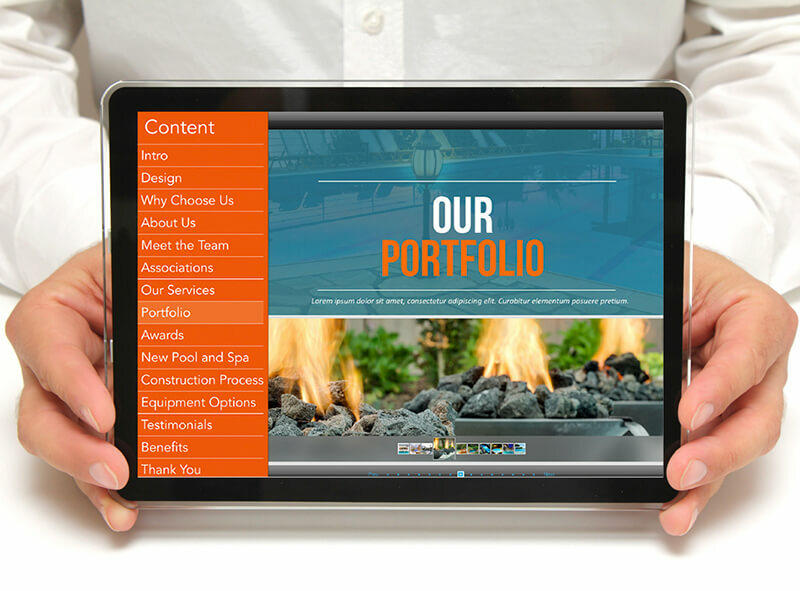 Go beyond traditional PDFs and boring data sheets with your own custom-made, Interactive Sales Presentation designed to engage your prospects with stunning portfolio galleries, company branding and more. The ultimate way to deliver your sales message to your prospects is sitting down, side-by-side, capturing their attention with our Interactive Sales Presentation. Our Interactive Sales Presentations provides you with the ability to convert your static content such as your logo, project images, and other company information. Get Personal. For one-on-ones and small group meetings the Interactive Sales Presentations enable friendly, informal discussions. Fluid Presentations. Interactive Sales Presentations are non-linear tablet presentations, which are more engaging than your simple left-right, PowerPoint slideshow. Take it Anywhere. Our Interactive Sales Presentations work both online and offline. You can be at any location, with a tablet, without WiFi, and continue pursuing your presentation. Get More Sales. Interactive marketing content has also been found to convert 2x better than traditional, static marketing content. Our Interactive Sales Presentations work best for any pool construction and retail company owners needing a professional way to showcase their company, products and services by enhancing the in-store customer experience. Earn up to 459,900 Points.